The Alaska Department of Transportation and Public Facilities (ADOT&PF), in cooperation with the Federal Aviation Administration (FAA) is planning to relocate the Noatak Airport. The purpose of the proposed relocation project is to provide the Village of Noatak with a safe, reliable, and cost effective facility that would provide the community with adequate access, support the community’s long-term development goals, and be consistent with current FAA safety regulations. Construct a new 4000’ x 75’ runway, apron, taxiway, and aviation support areas. Construct a new Snow Removal Equipment Building (SREB). 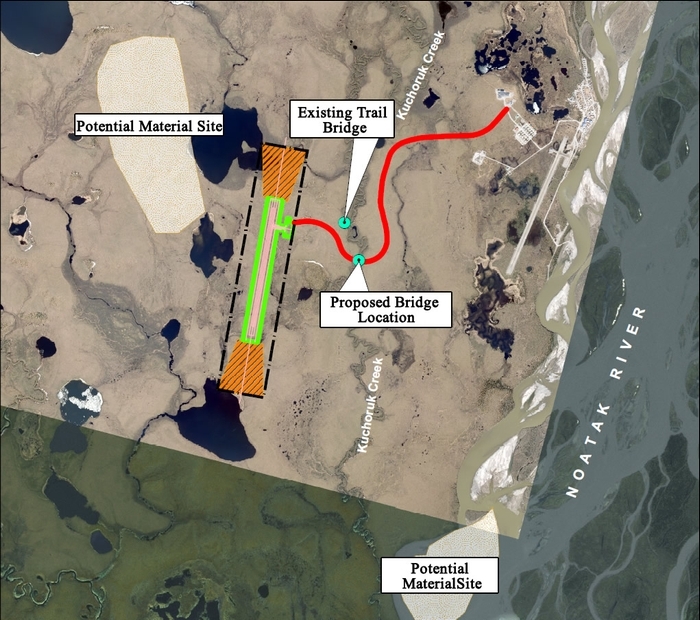 Construct an airport access road from the Village of Noatak to the proposed airport location. Install a single-span bridge over the Kuchoruk Creek at the new airport access road crossing. Develop a material site and necessary access routes during airport construction. Acquire necessary Right-of-Way for the new airport and access road. The DOT&PF is working on the engineering and environmental studies required to complete an Environmental Assessment under the National Environmental Policy Act (NEPA), which is required for this project. Completed reports and other relevant information on work completed to date can be found on the documents page. Provide input to the project team. Stay up to date as the project further develops. Keep a lookout for any upcoming project meetings which may be posted on this webpage or found in local advertisements.